Today I have a card for the Paper Smooches SPARKS challenge. The challenge was to make a card with a camera or a polaroid as the focus. For more details on the challenge check out the Paper Smooches SPARKS blog. I used two Classic Rectangle Spellbinder dies to create a polaroid frame and then stamped the sentiment by combining "Belated Birthday Wishes" from Word Salad and "Fishes" from Birthday Buddies. I masked off the "Wishes" from the Word Salad stamp so I could use the "Fishes" stamp from Birthday Buddies. 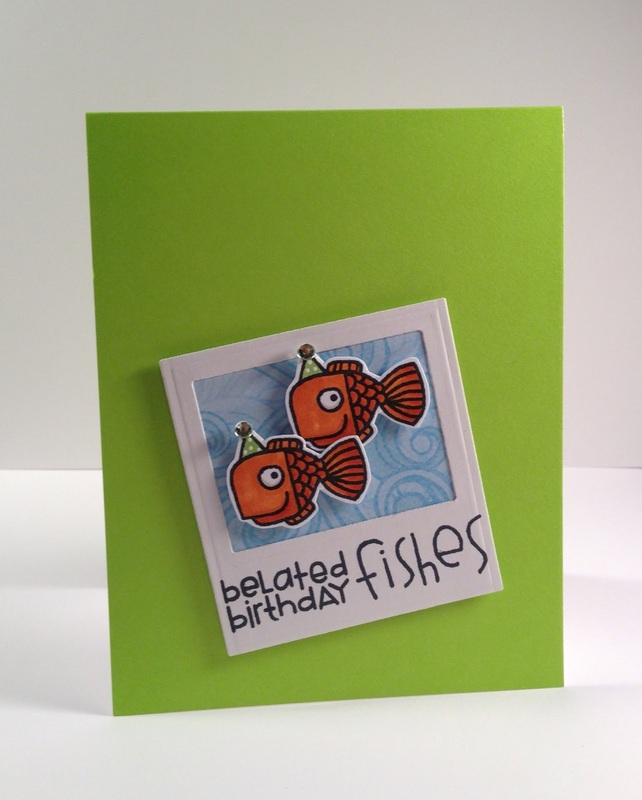 The two fish from Birthday Buddies were stamped with Memento Tuxedo Black ink, colored with Copics and fussy cut. I mounted them to the polaroid frame with foam dimensionals and added a green gem to the top of each hat. The wave paper in the background of the frame is from the Citronella pack from K&Company and the card base is from AMuse Studios. We're having a very snowy Sunday here so it's a great day for stamping. I hope you're having a great day. Happy Stamping!